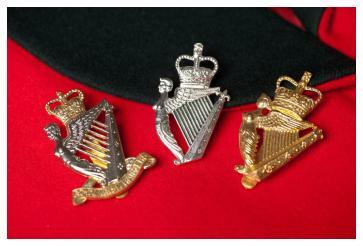 The new Royal Irish Regiment cap badge (centre) with Rangers (left) and UDR (right). 'The purpose of this short Army Bill is a simple one. Its provisions are solely designed to enable the merger of the Royal Irish Rangers and the Ulster Defence Regiment to take place on 1st July. We believe that the merger is very much in the interests of both the regiments concerned. In particular, it should greatly assist the efforts of the security forces to protect all the law-abiding citizens of Northern Ireland against terrorism from either side of the community. Planning is now going ahead for the merger to take place on 1st July, which is of course the anniversary of the Battle of the Somme. Both regiments will welcome the enactment of this Bill in good time for the merger to proceed, and for new terms of service and other important matters to be settled. 'In summary, this Bill provides the statutory framework to enable us to proceed with the regimental merger on the planned date of 1st July, thus bringing the UDR more fully into the regular Army. The Royal Irish Rangers will bring to the new regiment the proud record of service over 300 years of several predecessor Irish regiments. Although much younger, the UDR has developed its own distinctive tradition of local service to the community. This will also be retained, and enhanced, in the new regiment. We believe that the Royal Irish Regiment, with its dual home and general service responsibilities will command the respect of people of both traditions throughout Northern Ireland'. The Bill received Royal Assent on 16 March 1992, whereupon it became the Army Act 1992 and came into force on 1 July 1992.